How to Remove Tartar From a Dog's Teeth. When you think of caring for a dog you usually think of cleaning up his feces, bathing, feeding, washing and taking him for a walk. How many people actually thought that they would have to remove tartar from his teeth? Tartar can pose serious health risks to a dog such as heart disease. 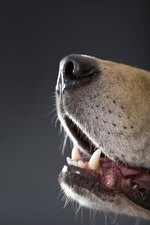 Follow these steps to clean tartar from a dog's teeth. Encourage your dog to chew on rawhide. It's very tough and scrapes away tartar as your dog chews. It is also natural and free of additives. Provide your dog with treats such as Dingo Denta-Treats Tasty chews if she doesn't like rawhide. These are slow to break up when chewed, removing tartar from your dog's teeth. They're available at most major pet supply stores. Feed your dog prescription dog food if the treats or rawhides aren't working. These foods are very tough to chew and scrape tartar from your dog's teeth as he eats. Brush your dog's teeth with baking soda and a wash cloth. Pull back her gums and rub her teeth in a slow, smooth movement. If the tartar buildup is advanced, her gums may bleed, so keep it short. Take your dog to the veterinarian if the tartar remains despite your efforts. They can clean the teeth professionally, but it requires putting her to sleep for the process. This should be a last resort because it can be very scary for you and the dog.